Note: All images in this post are from Sematext Cloud solution and its Node.js monitoring integration. With regard to garbage collection metrics, we should first measure all the time spent for garbage collection. In addition, it is useful to see how often a full GC cycle — or incremental GC cycle — is executed. The size of heap memory can be compared with the size of the last GC run to see if there is a growing trend. The secret of Node.js’s performance is its ability to be CPU bound and use async operations; in that way CPU can be highly utilized and doesn’t waste cycles waiting for I/O operations. This means a server can take many connections and will not be blocked for async operations. As soon as the operation is finished, callback functions are used to continue processing. The implementation is based on a single event loop, which processes the async function calls in a separate thread. Using synchronous operations drags down performance because other operations need to wait to be executed. That’s why the golden rule for Node.js performance is “don’t block the event loop”. To scale Node.js beyond the capacity of a single process the use of master and worker processes is required – the so called “cluster” mode. Master processes share sockets with the forked worker process and can exchange messages with it. A typical use case for web servers is forking N worker processes, which operate on the shared server socket and handle the requests in round robin (since Node v0.12). In many cases programs choose N with the number of CPUs the server provides – that’s why a constant number of worker processes should be the regular case. If this number changes it means worker processes have been terminated for some reason. In the case of processing queues, workers might be started on demand. In this scenario it would be normal that the number of workers changes all the time, but it might be interesting to use a Node.js monitoring tool to see how long a higher number of workers was active. One such monitoring tool that lets you track the number of workers is our Node.js monitoring integration. When picking a monitoring solution or developing your own monitoring for Node.js, make sure it is capable of filtering by hostname and worker ID. Keep in mind Node.js workers can have a very short lifetime that traditional monitoring tools may not be able to handle well. There is a steadily growing number of frameworks to build web services using Node.js. The most popular are: Express, Hapi.js, Restify, Mean.io, Meteor, and many more. Of course, Node.js apps don’t run in a vacuum. They connect to other services, other types of applications, caches, data stores, etc. 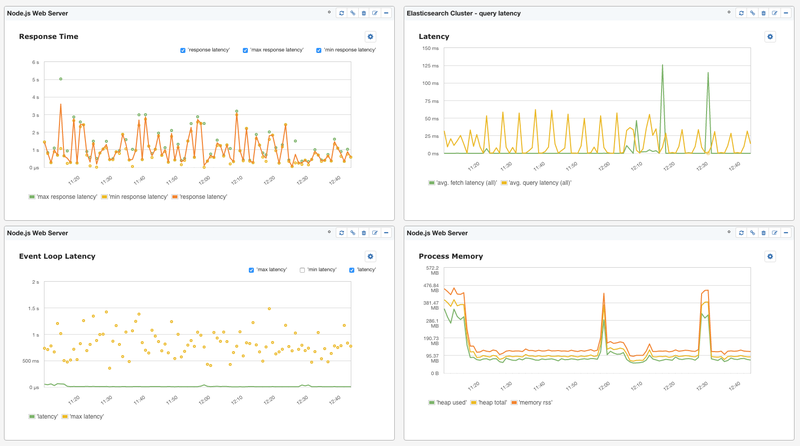 As such, while knowing what key Node.js metrics are, monitoring Node.js alone or monitoring it separately from other parts of the infrastructure is not the best practice. If there is one piece of advice I can give to anyone looking into (Node.js) monitoring it is this: when you buy a monitoring solution — or if you are building it for your own use — make sure you end up with a solution that is capable of showing you the big picture. For example, Node.js is often used with Elasticsearch (see Top 10 Elasticsearch Metrics to Watch), Redis, MongoDB, etc. Seeing metrics for all the systems that surround Node.js apps is precious. 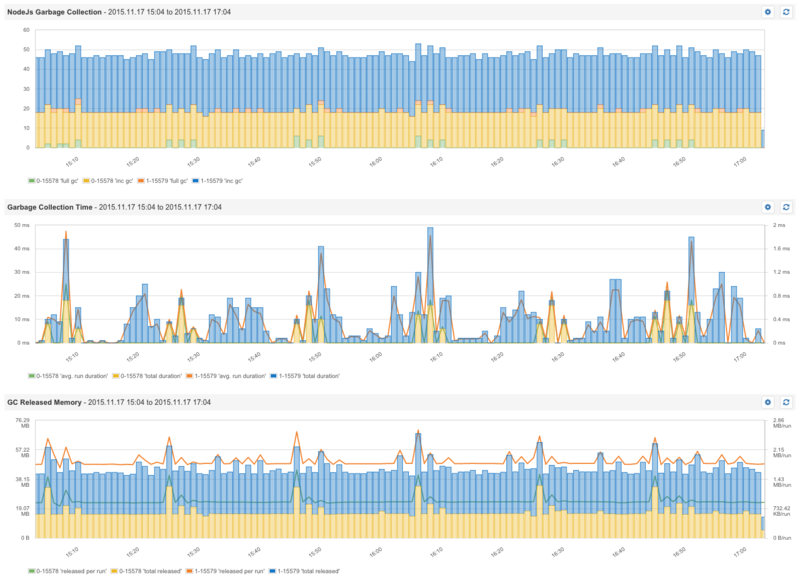 Here is just a small example of a Node.js monitoring dashboard combining both Node.js and Elasticsearch metrics. And…if you’d like try Sematext to monitor Node.js yourself, check out a Free 30-day trial.